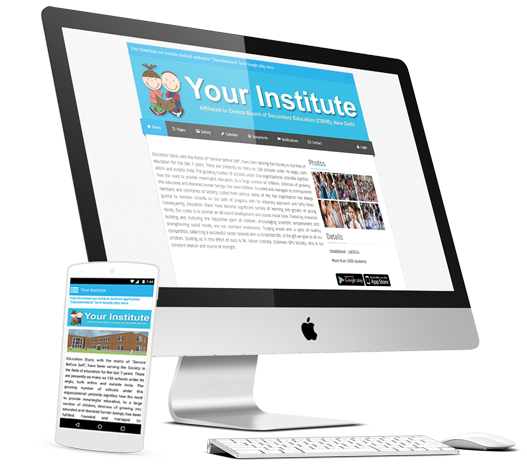 Easy to use, affordable and powerful software to manage schools and colleges. 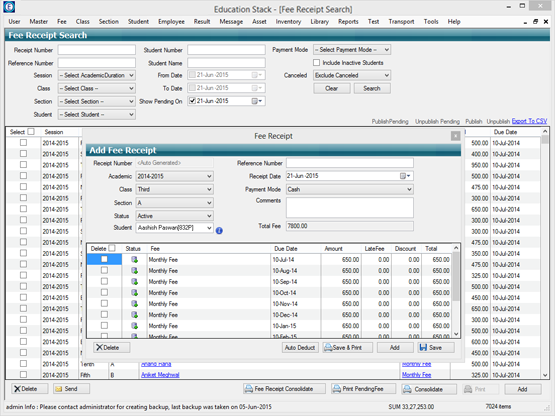 Automate everything ranging from fee, results, attendance, salary, library, transportation, etc. with Intelligent software built with latest technology. Students login to access fee, results, attendance, etc. from anywhere. High performance website with albums, documents, SEO & social media. Awesome iOS and Android native app with gallery, documents, events, push notifications etc. Keep everyone informed with reliable SMS notifications. Comprehensive solution with easy to use features. 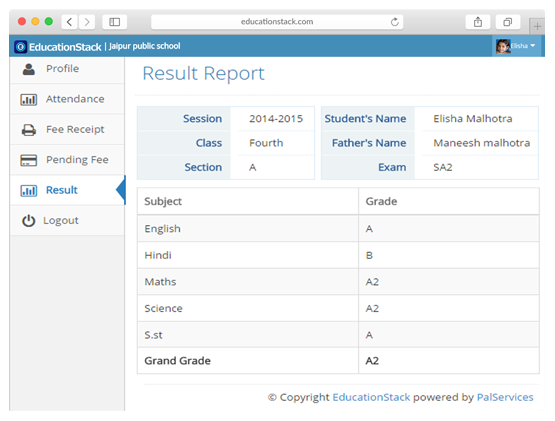 Grades and marks system with beautiful reports cards. Maximize on time revenue with pending fee reminders. Easy to maintain and track student presence. Manage student across sessions. Attach photo, comments & docs. Easy teacher management including leaves & salary. SMS Notificaitons, Library, transportation, inventory, reports. Student information accessible from everywhere and on all devices. Secure personalized login credentials for every student and parent to empower with information. Simple overview of all receipts and upcoming fee. Pay fee online with few clicks. 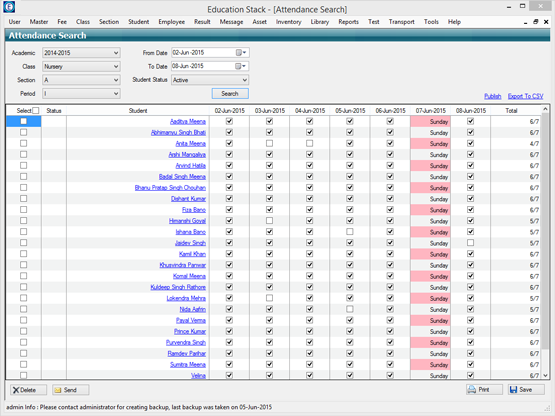 Easy to track student presence in institute on daily basis. Facilitating parents to monitor and track their ward’s progress. Stay connected with students and parents. Share important and relevant information with students and parents like message from Director/Principal, upcoming events, photos of functions/events, holiday homework or documents, contact information, etc. on all devices with beautiful responsive website. Plus iOS and Android native app with push notifications. Let people find your institute on the internet and share the amazing picture with everyone on the social media. Website and app are absolutely and will stay free. We will even help you to build good website and app. We believe technology is a game changer, specially in education domain. It can help students, parents, teachers and management to stay connected and exchanging information almost in realtime while utilizing internet, mobiles, etc. It can enable institute to focus more on providing quality education while simplifying and automating day to day tasks. During the summer of 2008, it all started with a simple idea to empower educational institutes with free software that is easy to use, automate several day to day tasks. With quick initial prototype we were already able to help few institutes with basic stuff like results, fee, salary, etc. The feedback was very positive so we continued development. As we work very close to institutes product development team continuously receive feedback and push at least two major release every year. We managed to do this from many years and result is smart software with wide range of features. Meanwhile, we realised that institutes not only love our software but also like our presence and attitude towards making things work. After requests from many institutes we started offering dedicated support however we are still providing free software to institutes. Sold first subscription to school in Bikaner. New revenue stream with SMS. New cities Jaipur & Sri Ganganagar. Webpage, online result & multi branch. Media Event for schools in Jaipur. Android app for school & colleges. 300 customers, +60 students, new city Delhi. Saas Solution with focus on mobile Expand to 1000 customers. Every institution wants to manage each and everything perfectly. Whether we talk about taking attendance, generating reports, managing transportation, everything needs to pinpoint correct. But, now the quest arises how to do that? Answer is very simple: A software, yes a software for a school, college or any institution can make life too easy. So, we would say a school management software is must for managing day to day school tasks and that makes it quite essential. With increasing complications in various systems at primary level or secondary, a complete software solution is required which can help people to stack their management information at one place. Technology is gaining more importance and with this it becomes vital to make employment by simpler means. Keeping this in mind, all the commercial centers like schools, banks, hospitals and others are keen on using this system. This will surely facilitate faster economic growth and speedy transactions. School management system is a boon to education systemNumerous schools have opened in all the areas compelling the management to include this software for convenient functioning. A variety of smaller tasks sum up to take away a lot of time. This work can be completed in minutes using school management system. This will also lead to advancement in managing all the courses as well as education system via web. You can, thus, run the institute successfully using this system and make a good impact on the overall education system. School management system is so advanced that it will inform the teachers, students and their parents about upcoming events and important notices via SMS. This will bring into effect continuous interactions and effective education benefits. This software is being used by many of the education agencies for their daily operations. In this tech-savvy world, it is very essential to keep pace with upcoming software and changes in the education system. Perks of having a school management systemMany people think that there are not many tasks in a school which require full-fledged school management software. This myth can be vanished by introducing this software and listing out the functions that can be performed here. 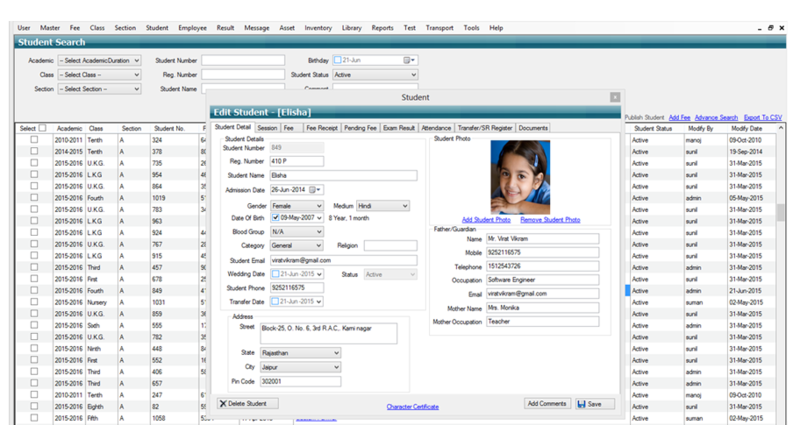 If you are unaware of the perks of having school management software then you should certainly look into the details. It helps in registering a new student and maintaining his or her record throughout the year. 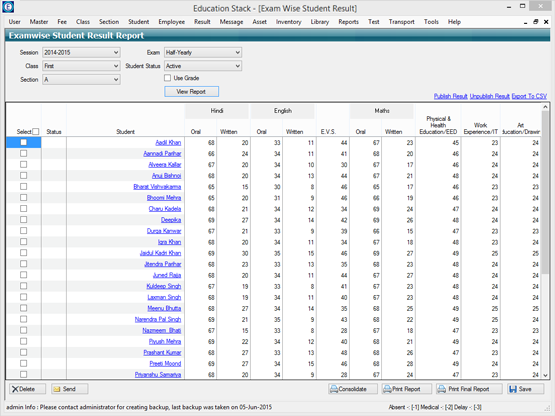 You can later on access a student’s performance from the data. Easy communication between the parent and teacher is very important and this can be achieved well using this software. Technology and applications run hand in hand. It helps people to get away with various hindrances and problems, thus heading towards progression. It also helps in stacking evidence of all the activities. Thus, take help of such software to bring noticeable change in your system and reap the benefits. How is school management software revolutionizing school system? Technology is evolving at a swift pace and what better than to take advantage of this ever budding global village. In today’s time, there is an online tool for everything, be it tallying your accounts or co-ordinating with employees within the firm. Thanks to invention of Internet everything can be done with just a few simple clicks.A number of sectors like retail, art, electronics and others have happily dove into the new age wave of online tools, the educational field is not far behind. A number of developers have created online School Management Systems that are making the life of Educators simpler by the day. And by Educators I do not mean only the teachers, the School Management System can be used by every employee of the educational institute. From the admin department to the principal, all of them can be kept in the loop.Let’s see what exactly these Schooling Systems have in store for us. 1)&nbsp;&nbsp; &nbsp;Administration made EasyRunning a school is no easy task. Taking responsibility of thousands of students at once can lead to innumerable piles of paper work. Printing ID cards, Report cards, attendance sheets, exam papers and readying other such important documents is a daily task. With a well-organized Schooling System all of this can be done with minutes. And since a number of employees can use it together, there is no chance of doing unnecessary, double work.2)&nbsp;&nbsp; &nbsp;Parents-Teachers interactionThrough these systems, parents can get in touch with the teacher online. They don’t necessarily have to take an off from work and come have a word with the teacher. Personal and group discussions can be done through the features available in the system.3)&nbsp;&nbsp; &nbsp;Posting Homework, timetable, important assignments.This is one feature every Parent and Teacher is going to cherish. Children below the age of 10 often lag in communicating school work to their parents. This is one obvious problem every school faces. By being able to post homework, time tables, assignments, holidays, etc, teachers will be able to directly inform parents about all the crucial activities and update them about the curriculum.How these features work in the favor of the entire Schooling System:1)&nbsp;&nbsp; &nbsp;Save timeBy installing a Schooling System, everyone saves a lot of time. Things no longer have to be done on paper. A few commands of Copy Paste are enough to send notes, print ID cards or even set the exam paper.2)&nbsp;&nbsp; &nbsp;Reduce AmbiguityRunning an educational institution is no child’s play. Apart from children, a number of other individuals are involved in a school, parents, teachers, administration staff, bus drivers and special help who take care of the kids. A simple online tool will inform everyone about the latest updates leaving no room for confusion.3)&nbsp;&nbsp; &nbsp;Keeping Parents in the LoopParents are often worried about being able to know what their kids are up to in class. A number of schools came up with ideas like installing cameras in class rooms, unfortunately this technique backfired. Instead of becoming disciplined children became uncomfortable, this in turn hampered the growth of a child. A Schooling system will do nothing like that. Children don’t need to know (unless absolutely necessary) about the discussions taking place amongst teachers and parents. This way the parent will be informed and the child will be free to learn and make mistakes.4)&nbsp;&nbsp; &nbsp;Eco-friendlyThat’s right, a Schooling System is not only beneficial to the functioning of the school but also to the environment. By using online features, schools will no longer use large amount of paper. Everything will be accessible through mobile phones or computers, there will be absolutely no reason to cut down trees and turn them into long attendance sheets or other school document.5)&nbsp;&nbsp; &nbsp;Easier to Access InformationIt is easier to access information through a School Management System than piles and piles of official educational files. You can simply log on to the given portal, type in the important keywords and get access to everything from the timetable of your child’s class to their results.These features are not far away, if you are a parent, your life is about to become easier. So sit back and wait for technology to take over. With the growth in the usage of smart phones, software applications and web portals, the use of technology has become omnipresent. Speaking of education sector, especially schools, a new breed of software has started flourishing and that is none other than the school management software. Trying to create another dimension in the sector, it is utilizing technology as a strategic source for administration, faculty, staff, parents and students. In fact, it has become more of an essential component for education institutions where it is almost impossible to thrive without it in the 21st century. School Management Software Offering quality education should be on top of every school’s priority list and this is not possible if they keep themselves engaged in administrative work. The number of students enrolled at any school or college, at a time, is huge and it is an elephantine task to manage and maintain records of such a large number of students. School management software has been introduced with the prime motto of helping management with this huge responsibility. The software fosters you in various tasks including Student Data Entry, General Registeration, Examination Marks Entry, Attendance, Fee Processing, Employee Payroll and Leave Management, sending SMS notifications and more. With school management software by your side, you get improved accountability, increased revenue and quicker, automated receipting &amp; inventory control. Online Web Portal One of the unique extensions of school management software is the web portal. It is an excellent tool that enables school teachers, administrators, parents and students to come together and share information. The details that school staff or administration feels like feeding on the portal would reflect immediately. This may include vital information like attendance records, exam results, important announcements, timetables, holiday information or other details. Using this online application, the educational institutes can increase direct parent interaction. Also, they can share school news and events with photo upload. All in all, it is a wonderful application to move towards a better future and one should make use of it at every cost.